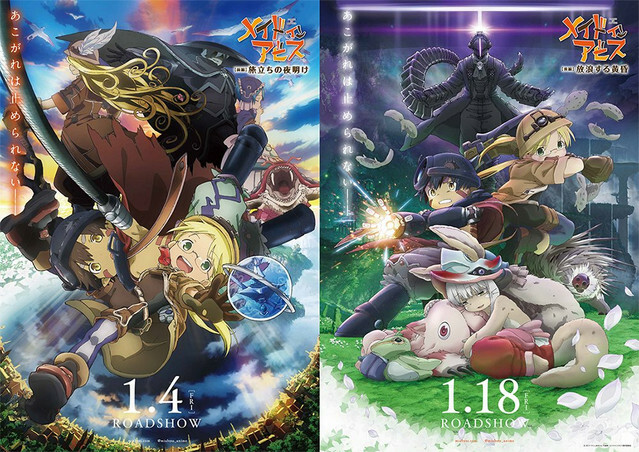 The official website for the anime adaptation of Akihito Tsukushi’s fantasy adventure manga series Made in Abyss has posted two 45-second trailers for its two forthcoming compilation films based on the 13-episode first TV series. The first part “Tabidachi no Yoake (Departure at the Dawn)” is set to be released on January 4, 2019, then the second part “Hourousuru Tasogare (Wandering Twilight) will follow two weeks later. Following the two films’ release, a newly-produced sequel episode or series will be available in near future. The Kinema Citrus-produced first TV anime was aired for 13 episodes from July to September 2017, then won Anime of the Year at the 2017 Crunchyroll Anime Awards. The sequel project was revealed at the “Deep in Abyss Gatari” event in Tokyo in November 2017.